Petty Officer Jon Moore found the bottle and message during the cleanup of a stretch of beach in Hawaii. (CNN) -- On a scenic Hawaiian beach, a sailor found a message in a bottle that was sent about five years ago by a sixth-grader in Japan. Petty Officer Jon Moore spotted the bottle Thursday during a beach clean up project near the Navy's Pacific Missile Range Facility on the island of Kauai. Moore was among a group of sailors plucking cigarette butts and food wrappers from the beach when he spotted it. "I looked over and saw the bottle. I jokingly thought it would have a treasure map inside, but it actually had a message," Moore said. Inside the bottle were four origami flowers and a letter signed by student Saki Arikawa. There was also a picture of Arikawa's class from Kagoshima, a city in Japan's southern island of Kyushu. The letter was dated March 25, 2006 and Arikawa's note asked that whoever found the bottle to write back. Somehow the bottle had traveled some 4,000 miles and reached Moore. Moore said he immediately thought of home. Even though he was born in Guyana, South America, he said Japan feels like home because his wife and son live there. 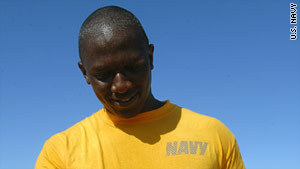 The sailor said he plans to visit Kagoshima on his next trip home to visit his family. And he also has a letter to write. "I'll definitely respond. I want to write back to the school and get their thoughts," Moore said.